As soon as I saw the Clandestine Cake Club Cookbook, I knew immediately I wanted to make this Pistachio & Lime Cake for my friend’s upcoming birthday. This is one of Lynn Hill’s own and it is the one that graces the front cover of the book. So for the grand finale of my friend’s birthday bake, this is what I made – my most ambitious cake yet. I had kept back a few of the Brazilian limes on purpose to go out with a bang. I made my signature lime and ginger curd as a filling for the cake and also thought I’d try making crystallised lime to decorate the top. I had plenty of organic eggs courtesy of Penbugle Farm. I made my usual adjustments, you know I can’t help it. Sliced two well scrubbed lime very thinly. Simmered in a sugar syrup made of 50g granulated sugar and 50ml water for about 45 minutes (or until the peel is soft and translucent). Laid out on some parchment paper over a wire rack in a warm place for 24 hours to dry. Creamed 300g unsalted butter with 300g caster sugar, with my trusty wooden spoon, until very pale and fluffy. Grated in the rind of three well scrubbed limes and creamed some more. Chopped 50g pistachio nuts into bits & beat these into the mixture. Beat in 5 large organic eggs one at a time, adding in a little flour with the last two to prevent curdling. Sifted in 300g flour (half wholemeal, half white) with 2 tsp baking powder and 1/4 tsp bicarbonate of soda. Stirred this in as gently as possible together with the juice of two limes. Divided the mixture between three 8″ cake moulds and baked at 180C for 20 minutes until the top was firm and a skewer inserted into the centre came out clean. Whilst the cakes were cooking, made a syrup by heating the juice of two limes with 2 tbsp caster sugar until the sugar had dissolved. Poured this over the cakes as soon as they were out of the oven, then left them to cool. Turned out onto wire racks to cool completely. Creamed 150g unsalted butter with 150g icing sugar until very pale and fluffy. Grated in the zest of a lime and creamed some more. Beat in 150g cream cheese. Melted 75g dark chocolate in a pan over hot water. Poured onto a wooden board and spread out to about 3mm thickness with a palate knife. Sprinkled 25g chopped pistachios over the top and left to set. Cut into longish triangular shards. Roughly chopped another 50g pistachios. Placed one of the cakes on a serving plate and covered with a third of the cream cheese icing. Spread 3 tbsp of ginger and lime curd over the top. Scattered over a third of the pistachios. Placed a 2nd cake on top and repeated the process. Placed the 3rd cake on top and spread with the remaining icing. Placed a ring of crystallised lime rings around the outside of the cake. Stuck the chocolate shards in the centre. Scattered the remaining chopped pistachios over the top. Many thanks to Lynn Hill for this wonderful recipe. It made a stunning cake and caused a sensation among the party guests and most importantly of all, the birthday girl was absolutely delighted. Oh and by the way, it was truly mouth-watering. I’m entering this wonder into Bookmarked Recipes. This is a monthly event hosted by Jac of Tinned Tomatoes. As I made everything here entirely from scratch, I am entering it into Javelin Warriors Made with Love Mondays. If this is a credit crunch cake then I can’t wait to see you really push the boat out! The cake looks amazing! I bet the flavours all worked really well together too. Lime and ginger curd sounds pretty good on its own, let alone stacked up in a three-layer cake! Oh I love the flavours here! Have never tried lime curd but sounds mouth-wateringly good with the chocolate, cream cheese and lovely sponge. Choc, that looks amazing! What a great job you’ve done – and the chocolate shards look especially fabulous! 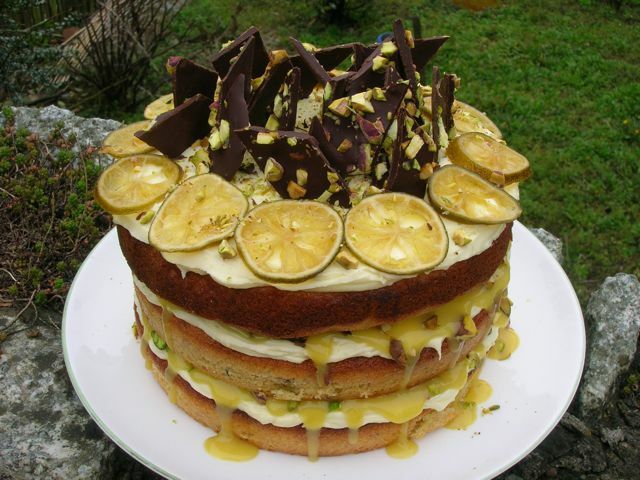 my EYES are bleeding from staring at this glorious cake for too long… I dont know where to start… it’s simply stupendous, amazing, glorious… and with all the fabulousness dripping out of the cake… I also ADORE the pistachio bark, wow, that’s fantastic!… nice work Miss C! This looks like a serious showstopper of a cake! I love the chocolate shards on top too. WOW! What a cake!! Love it!! I love all your posts and have nominated you for a versatile blogger award. Wow what a towering masterpiece of deliciousness. Looks fabulous and very special. Will have to try your ginger lime curd as have lots of limes in the fridge. I thought I’d commented on this already but I think your word verification out-foxed me again! This really is a stunning cake, each element on its own sounds delicious (especially the curd) and I can only imagine how well they all work together. Sorry Nat, I know the verification is a real pain and I wish I didn’t have to use it. Thank you, I was just a little bit pleased with this cake. The cheese buttercream worked really well and was just the right consistency. The original recipe had used a lot more butter etc (250g) and less cheese to butter with (200g), but I thought that seemed rather excessive and I had just the right amount for my cake. The limes were a little chewy, but good nonetheless – have fun. It’s ok, it was probably me not checking that the comment had posted before clicking away from the page! Oh my goodness Choclette, that is one amazing cake. Wow! Wow, Choclette! What a magnificent cake! Beautifully dressed and sounds absolutely delicious too! Definitely a cake to impress! Wow, gorgeous cake! I got that cookbook for my birthday so may have to have a go myself. Those pistachio chocolate shards are amazing, I am not sure they would stick around to make it onto the cake! Thank you very much Helen. I’d forgotten you’d made it too, but now remember. I haven’t made an extravagant cake like that in a long time.